Does Shea Weber Deserve the Norris Trophy? Allow me to preface this article with the following: Shea Weber is one of the best defensemen in the world and a guy the Nashville Predators should hold on to long-term. Trading him is not the answer for a variety of reasons, and if this club evolves into a contender during the Peter Laviolette era, Weber will certainly be a huge reason for that success. Now that we got that out of the way, I want to take a detailed look at Weber’s performance this year to see if he truly deserves the Norris Trophy. You may have noticed Nashville has been campaigning hard for its captain, who has been snubbed for this award on several occasions. Naturally, many fans and fellow writers have echoed the Preds’ sentiments, but a lot of folks—even some outside of Boston and Chicago—refuse to jump on this bandwagon. Yes, there have been some rumblings from members of the stats community that Weber is a tad overrated, and it’s easy to understand this point of view: Though he found the score sheet at a remarkably high rate in 2013-14, Weber didn’t exactly drive possession. He wasn’t poor in this regard, but he wasn’t anywhere near the best, either. Still, the praise flowed in. The categories Trotz was referring to were likely scoring metrics and time on ice, which were fair to bring up. After all, Weber’s offensive value cannot be overlooked: his 56 points in 2013-14 ranked third among all D-men, and his 23 overall goals and 12 power play tallies were both more than any other rearguard. Skating for a team short on talented forwards, these contributions were not only important to the Preds’ success—they were essential. 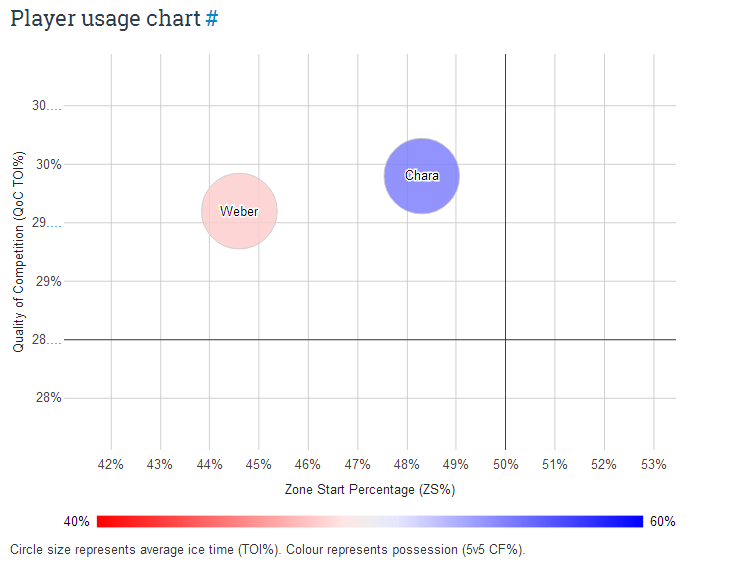 Additionally, Weber earned more minutes per game than all but three skaters, dwarfing most NHLers in TOI. Those minutes came in virtually every situation, as he was a staple on both the power play and penalty kill. So Weber scored a lot of goals and proved (once again) capable of handling lots of ice time. These facts alone are enough reason to believe he had a strong season. But if we look at stats that reflect his defensive aptitude—which is important to do, because, you know, he’s a defenseman—there are few reasons to believe he was the best at his position in 2013-14. Tyler Dellow published an interesting piece last week on CorsiRel and famous D-men that views Weber and his former partner, Ryan Suter, in an interesting light. A key point made by Dellow is how both Weber and Suter have seen their possession numbers tumble since being split up in the summer of 2012. This should not come as a surprise: Two stars who have chemistry and history are going to put up better numbers together than with inferior partners. Common sense. Nonetheless, one would think a Norris finalist such as Weber would be able to put up good possession stats alongside guys who aren’t perennial All Stars. That simply has not been the case. Consider this: During the 2010-11 and 2011-12 seasons—when Nashville advanced to the second round of the playoffs twice in a row and still had Suter on its payroll—Weber posted CorsiRels of 13.0 and 11.2, respectively. In the last two seasons, that figure has dropped to -2.1 and -1.9, as per behindthenet.ca. Corsi is a flawed stat, and it doesn’t tell us everything, but changes this severe are worth mentioning. Even though Weber faced the oppositions’ best players every night in 2013-14 and skated nearly half of every game, it’s hard to overlook the fact that he posted a worse EV shot differential than his team did when he was off the ice. Even with the added burden that comes with being a franchise D-man, a true Norris winner doesn’t let this happen—severe circumstances notwithstanding. Now, let’s check out how Weber looks when compared to some guys I feel performed at a Norris-caliber level in 2013-14. Let’s start with the obvious choice (and the guy who’s probably going to win the trophy in question): Zdeno Chara. 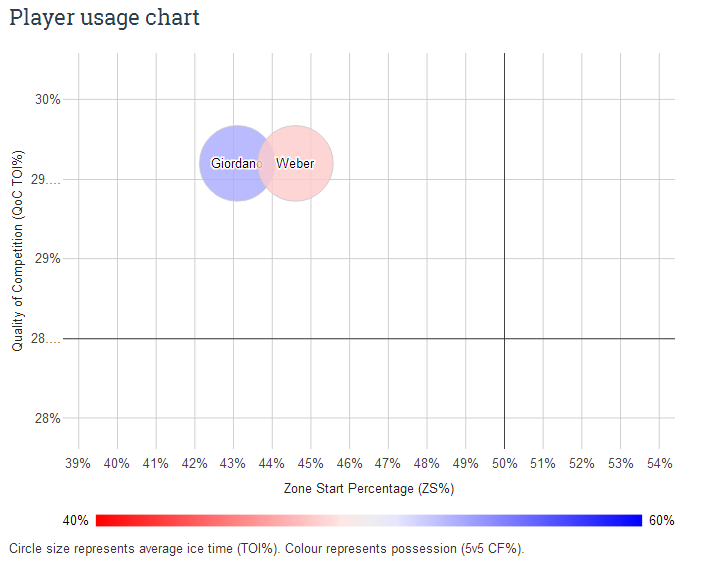 As the above chart shows, Chara played against slightly better competition than Weber, though Weber started less shifts in the offensive zone. The differences here aren’t precise, but they aren’t all that significant. What is significant is the difference in shades between the two bubbles. Chara finished with a 5v5 CF% of 55.2, which is a heck of a lot better than Weber’s 44.2. More importantly, Chara posted a CorsiRel% of 1.8, which may not seem remarkable on the surface, but speaks volumes of his abilities. The Bruins are one of the best in the league in controlling the puck, so for Chara to finish nearly two percentage points ahead of his team in Corsi shows how valuable he is in this department. Imagine what Chara’s CorsiRel% would be if he played for a team like Nashville. It’d be a heck of a lot higher than 1.8. It’s tough to compare Chara and Weber to fellow Norris finalist Duncan Keith, who started the vast majority of his shifts in the offensive zone and faced worse competition than the aforementioned two. Frankly, I don’t think Keith deserves to be in this conversation. So let’s look at another top D-man who plays a similar role as Weber. How about Mark Giordano? Giordano skated for an awful Flames team, and since he was one of Calgary’s few good players, he got some rough minutes. As this player usage chart shows, his QoC was about the same as Weber’s, but he had a lower ZS% and finished with a much higher Corsi—53.3 percent. Here’s where things get interesting: Giordano actually had more points per game in 2013-14 (0.734) than Weber (0.708). Huh. So Giordano drove possession far better than Weber did and created a lot of offense, as well. This raises the question: Why do so many people want to see Weber take home the Norris, but so few talk about Giordano’s accomplishments? I suppose there are two main answers: 1) most PHWA voters don’t use advanced stats in the decision-making process; and 2) Weber is famous and filthy rich, while Giordano is neither of those things. The above data shows the trio of Giordano, Chara and Weber were deployed similarly throughout 2013-14, and it’s clear that Weber was the least impressive of the three in terms of possession. Consider the fact that Chara and Giordano both chipped in a lot of offense, and it’s clear that they were more valuable players than Weber. I suppose if one was to make a case for Weber over Giordano and Chara, that person would cite Weber’s TOI and production on the man-advantage. This hypothetical person would have a good point, but when we consider the meaning of the award in question—which is presented to the top “defense player who demonstrates throughout the season the greatest all-round ability in the position”—it becomes clear that Weber didn’t do enough to separate himself from the rest. In the end, the advantages Weber has in TOI and PPP are far less meaningful than the advantages Giordano and Chara have in other respects. At the end of the day, winning the Norris is about being the most versatile, well-rounded blueliner in the NHL. Nashville’s captain wasn’t that guy in 2013-14. It’s also worth noting that Weber hasn’t been playing with mediocre teammates, even though a lot of people believe that to be the case. One point the Preds have made a lot in recent months is that No. 6 carried the load while most of their blueline was comprised of young, raw individuals. This is important to consider, but Nashville’s defensive corps is a lot better than many give it credit for. These days Weber spends the majority of time with Roman Josi, who has blossomed into a solid, reliable D-man who creates offense while being responsible in his own end. In 72 games, Josi finished with a slightly positive CorsiRel (plus-0.4 percent) and helped create a good number of Weber’s goals. Sure, Josi is no Suter, but he’s a talented guy who should start getting All Star consideration as he moves toward his prime. It’s not like Weber is forced to do everything by himself. Furthermore, Weber isn’t the only top pairing D-man out there who has had to make due with less-than-ideal partners. Chara has done just fine with 20-year-old Dougie Hamilton, as the two created a formidable duo for a good chunk of the 2013-14 regular season and into the playoffs. To be clear, I didn’t write this piece to disparage Weber and his talents. I think highly of him as an athlete and as a person, and I believe he’s the right man to lead the Preds into the future. What I am saying, however, is he hasn’t been a Norris-caliber defenseman since Suter left. Can that change? Absolutely. With a new system in place, an improved roster and a blueline that should only get better with age, it wouldn’t be surprising if Weber returns to this debate many times in the future. But right now, Weber is not the best defenseman in the NHL. So let’s just give the Norris to Chara and call it a day. And can we please start giving Giordano the attention he deserves? ← How Many More Points Will Halak Mean to Islanders? 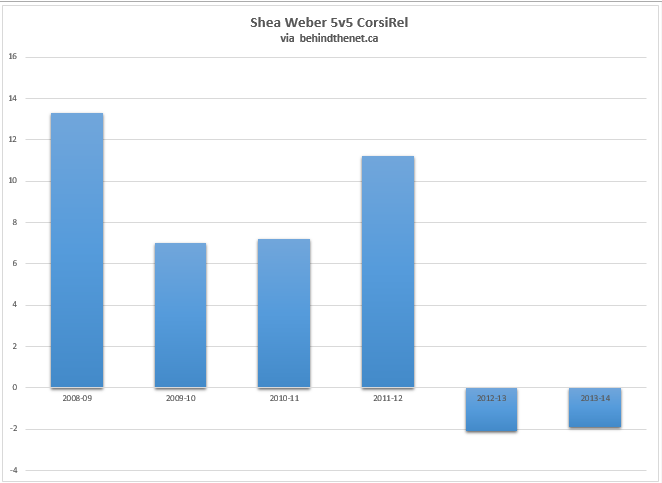 The only reason not to jump on the Shea Weber bandwagon is because he has not helped his team with playoff success. Keith could win it this year, that’s my bet. He hasn’t help his team get to the playoffs?? When you’re one of the top 3 leading scorers and producers on the team, I think you’re doing everything you can.